The fourth of July is past. It’s the middle of summer. The kids are bored. The days are hot. The lawn is drying out. The garden needs weeded. Can we go to the pool? There are few things more refreshing than a dip in the pool on a hot summer day. Just getting close to a pool is energizing: the smell of chlorine and sunscreen, the laughter of children, the sound of splashing water – it’s all good! Sometimes on our vacations, the most often repeated phrase (other than “are we there yet?”) was “can we go back to the hotel and swim?” It seemed no matter how interesting our destinations were — the pool was the most popular venue. 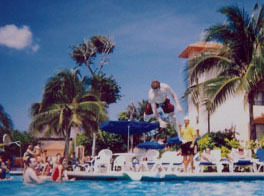 On a trip a few years ago, our son Bobby participated in a “Belly Flop” contest. This photo shows his amazing form and height. Oh yes, he came down hard; but he won! And, I’m sure the water felt great… after the initial smack. As we approach the middle of summer, are you starting to feel spiritually dried out? Maybe you want to sleep in on Sunday morning because you’re bored? Are you starting to feel a little restless? You just don’t have the energy, or desire, to open the Bible and read it each day? Perhaps you’re so far behind in the “Read-through-the-year” that you’re considering throwing in that towel? Are “spiritual weeds” starting to sprout? Do you find that you have to pull bitterness out by the root almost daily? Is unforgiveness popping up? Or anger? Are you longing for refreshment? Do you need a trip to the pool? When we fail to spend time with God regularly, we get parched. Our souls long for God, but sometimes we think we are longing for other things and we try to meet the longing with things other than God. What we really need is time with God. The more we spend time with the Lord, praying, reading and studying His word, the more our souls are refreshed. My challenge to you: Go to the Living Water and take a refreshing dive with the Lord. It’s not too late in the summer to start a new habit! If you’ve wandered into the desert of spiritual dryness by skipping your quiet time with Jesus, you can still turn around and get back on the right track. And when you do, you will find Jesus is right there waiting for you! Jesus is waiting to quench your thirst, renew your spirit, refresh your soul, and invigorate your entire being. Will you dive in with God today? If you’re afraid it might smack like a belly flop, you can rest assured the refreshing cool water of God’s Word will quickly revive you! Let our services during the summer, be the shower that refresh us after a heat spell. Yes, Bev… not only refreshing ourselves, but a huge refreshment to those we serve! Love ya! You always give me such refreshing words of wisdom. I need each day. Thanks Marcia love you! Thanks, Aunt Rachel. God is so gracious to allow us the privilege of refreshing one another ♥ Love you, too!